Let's drag a Butterworth IIR filter to our project. 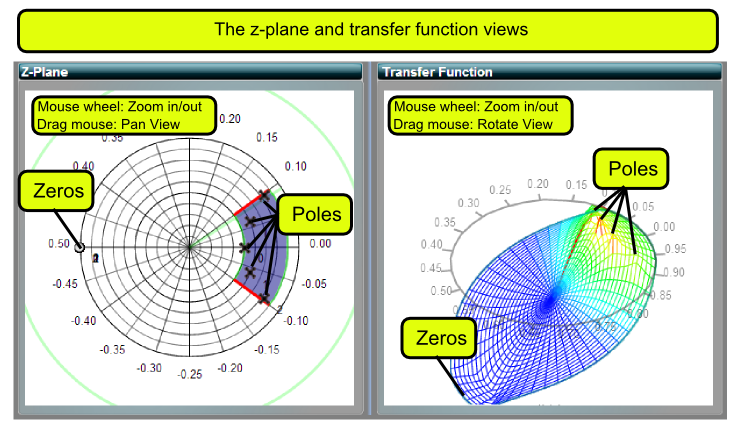 On the Z-Plane and Transfer Function views, you can drag the mouse to rotate and pan the view. Rolling the mouse wheel will zoom in or out. On the Z-Plane view, the X's are called poles and the O's are called zeros. 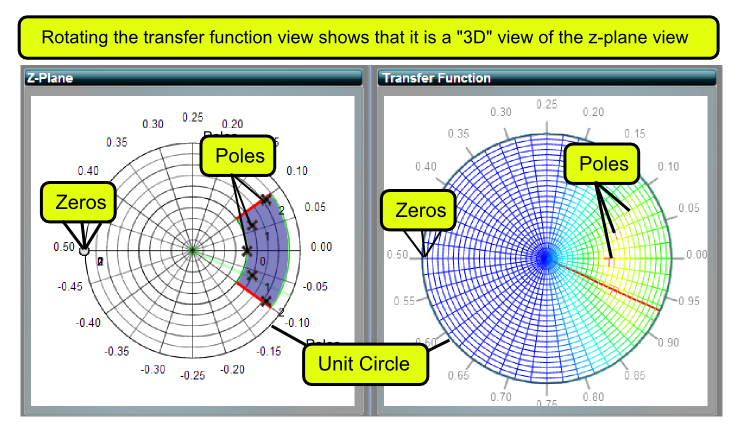 If you rotate and examine the transfer function view, you will see that it gets pulled up by the poles and pulled down by the zeros. It is the positioning of the poles and zeros that controls the shape of the transfer function which then controls the shape of the filter's frequency response. The outside of the circle is called the unit circle (because it has a magnitude of 1). We will soon see that it has special significance. The unit circle is where the z-plane meets the frequency domain. We'll reduce the order of the filter to 2, so we have only one pair of poles (and one pair of co-incident zeros). Now, grab one of the poles (The X) in the z-plane view and move it around using the mouse. You will see that the frequency response changes. 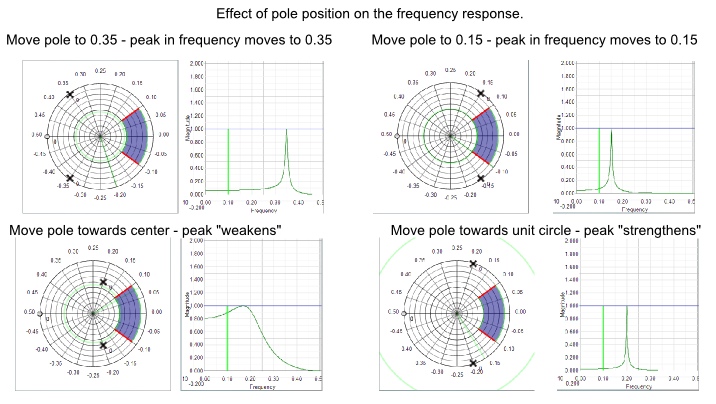 A "peak" appears on the frequency response as you move the pole around. Moving the pole towards the unit circle will cause the peak to become "stronger". Moving it towards the center will cause it to become "weaker". 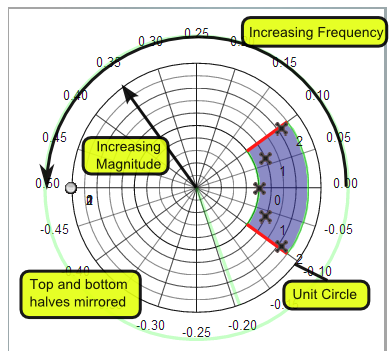 Rotating the pole around the center will cause the peak to change frequency on the frequency display. The poles and transfer functions are mirrored about the horizontal axis. You will find that the views are mirrored across the horizontal axis of the z-plane. The variable, z is a complex number which means that it has 2 coordinates that can be expressed as a radius and an angle. The radius corresponds to magnitude and the angle corresponds to frequency. If you go to the structure view, you will see 2 rows of equations at the top. These are the filter's transfer functions. The transfer function view is a graphical representation of this function. The top one is in pole-zero form and the bottom one is in polynomial form. They are both the same equation and the bottom one can be obtained from the top one by multiplying its terms together. The pole-zero form has the (negative) coordinates of the zeros on the top row and the (negative) coordinates of the poles on the bottom row. When the top row equals zero, the transfer function will be zero and this corresponds to a zero. When the bottom row equals zero, the transfer function will be infinite, because we are dividing by zero and this corresponds to a pole. You can see that when z = -1, (-1 + 1) = 0, the top row will be multiplied by zero, the transfer function will be 0, so we say that there is a zero at z=-1. When z = 0.457 + j 0.339, the bottom row will become zero. We are dividing by zero, so the transfer function will be inifinte and we say that there is a pole. When we multiply out the pole-zero form of the transfer function, we get the polynomial form. The polynomial form gives you the coefficients of the filter. The top row gives the feed-forward coefficients (think FIR) and the bottom row gives you the feed-back coefficients (think IIR). The transfer function of an IIR filter has both a numerator and a denominator, but the transfer function of an FIR filter has only a numerator. This is the last in the series of our introductory DSP tutorials. We hope to shortly produce a new series of tutorials, covering more advanced topics in DSP and Digital Filter Design.